The viola part for Strauss' Don Quixote, Op. 35 has been edited by Israeli-born Yizhak Schotten, an internationally acclaimed musician whom STRAD Magazine has called "one of America's finest viola players... a leading light of the U.S. viola establishment." Schotten's bowings, fingerings and other editorial markings have been added throughout the score. Richard Strauss' Don Quixote is a tone poem for cello, viola and large orchestra. Don Quixote was completed in Munich in 1897, with the premiere taking place in Cologne in March 1898. Strauss' composition is based on the novel Don Quixote de la Mancha by Miguel de Cervantes. The score is 45 minutes long and is written in theme and variations form, with each variation representing a different "episode" or story. All of these episodes are taken directly from the Cervantes novel, with the solo cello representing Don Quixote, and the solo viola, tenor tuba, and bass clarinet depicting the comic Sancho Panza. 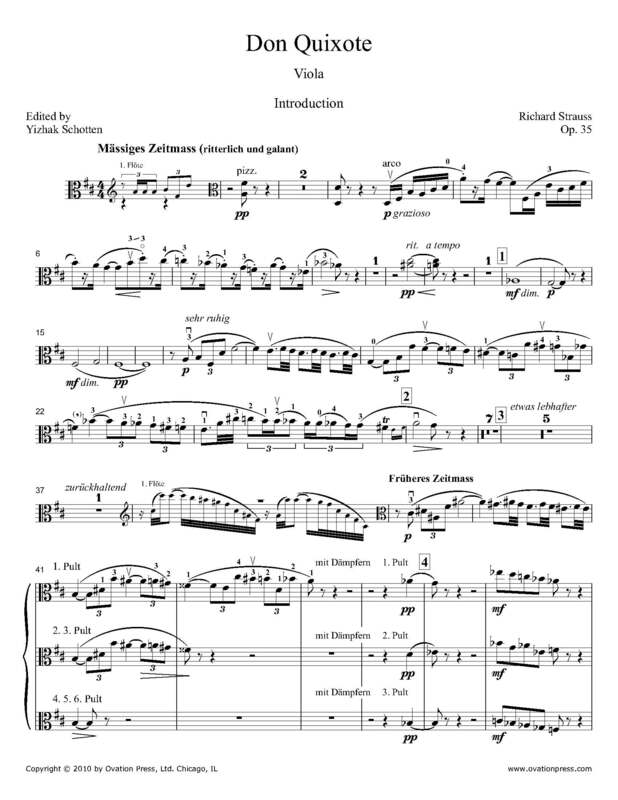 Download and print the score today to gain access to expertly edited Strauss Don Quixote viola fingerings and bowings from Yizhak Schotten!